Prior to the event we had proclamations from Oregon Governor Brown and Wilsonville Mayor Knapp for Sept 12th-20th to be "Drive Electric Week". Half of the pre-registrations were not EV owners. 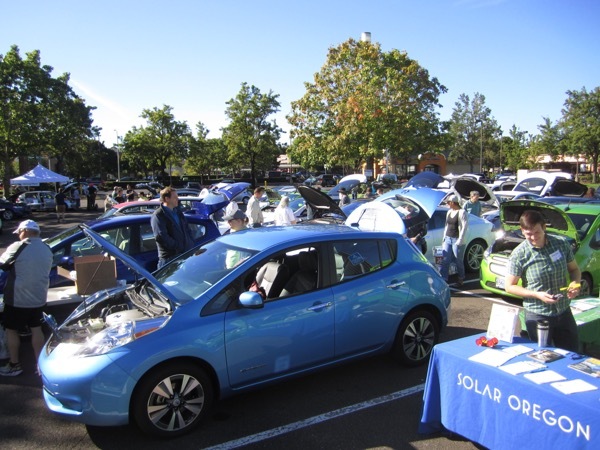 We had a large number of attendees seriously researching EV's for immediate or future purchase. Our location also provides a fair amount of "walk-up" traffic so we were able to interact with many people curious about EV's in general. We will be awarding two "Ultimate Test Drive" prizes this week: Use of a Nissan LEAF for a week courtesy of Platt Auto and a 3 day test drive of an i3 from BMW Portland. The OSU Solar Trailer arrived with it's 25kWh battery fully charged and the sunshine allowed it to generate 1.8kW from it's solar panels as it charged or off EV's at the show. When they folded up at the end of the event, they had provided power to at least 5 EV's and left with an empty battery. I believe this to be the largest gathering of EV's ever in Oregon, both by miles and total number. Nissan LEAF, Honda Fit EV, Chevrolet Spark EV, several Teslas, Think City, VW e-Golf (top left) and many other EV's. have proclaimed September 12th - 20th, 2015 to be "Drive Electric Week". Come celebrate with us on Saturday, September 19th! Contest hosted by our radio sponsor, KINK 101.9 FM. All about charging. Members of the Oregon Electric Vehicle Association (OEVA) will have handouts explaining how EV's are charged and lots of first hand experience to share. How affordable EV's can be. Leases allow the Federal Tax Credit to be used to effectively reduce the sticker price of the car. There are options below $140 per month, some with zero down. Pre-owned EV's are becoming readily available. Learn what to look for from owners, OEVA members and dealers who specialize in pre-owned EV's. How you can power your EV (or house) on sunshine. Solar Oregon will be holding a one hour Workshop on Residential Solar beginning at 12:30 PM. Topics include solar in Oregon's climate, available technologies, and more. More about Solar and Renewable Energy. Already own an EV? Bring it to the event! Chat and compare notes with other EV owners. Share your enthusiasm and help those exploring EV's understand why we're so passionate about driving them. Please register so we can allocate space for you. If you are arriving late or need to leave early that's OK. Just let us know and we will accommodate your needs. Driving an EV (or riding an e-bike or scooter) is the best way to appreciate many of the benefits of driving electric. Add a comment when you register indicating the vehicle(s) you'd like to test. This will help us get everyone behind the wheel (or handlebars) of their favorite EV. To the dealers & manufacturers listed above that are providing vehicles to test. To the other companies and organizations that are taking time to be here and share information. There are currently 196 attendees registered. Registered attendees report 1,066,267 electric miles driven.